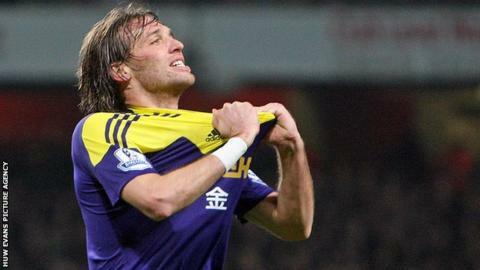 Swansea City hope to have forward Michu back in their squad for the vital Premier League clash at Newcastle United on Saturday. The Spaniard has been troubled by a long-term ankle injury but he now has a shoulder problem that will need a late fitness test. But head coach Garry Monk is positive about the 28-year-old's prospects for a return to the starting line-up. "I know he's eager to play and eager to get back in," Monk said. Michu was out of action for three months after having ankle surgery at the end of December but returned as a substitute in the 2-1 defeat by West Brom on 15 March. He has featured in four games since his return but missed last Sunday's home defeat by Chelsea because of the shoulder problem. "We pulled him out last week but he'll have a fitness test and we'll assess him then," Monk added. Michu was Swansea's top scorer last season but has managed only six goals this season, with just two goals in the Premier League. The Swans travel to north-east England for Saturday's game against Newcastle only three points above the Premier League relegation places. Monk admits his side are in a "serious" position with four games left - a run that also includes Aston Villa and Southampton at home, followed by Sunderland away. "We've been looking over our shoulder for a while now," Monk said. "It's a serious situation. We know that and we need to get points on the board as soon as possible. "Morale's great and the players are looking forward to these four games to try and do what we've got to do." Monk was put in charge of the Swans in February for the "foreseeable" future following the sacking of Michael Laudrup. However, the 35-year-old says neither himself nor his players are looking further ahead than the pressing task of avoiding relegation. "I don't think anyone's even considering their future right now, even the players themselves," Monk said. "We're all focused on trying to get ourselves out of this situation and get ourselves safe as soon as possible."